When we first arrived in Russia, I was expecting to see no American products here because of the sanctions. However, we've since learned that many American and European brands have factories in Russia whose production is not limited by sanctions. As a result, we've been able to get at least some of the foods and products we buy in America, although some taste or perform slightly different. For example, Coca Cola is made with real sugar here - not corn syrup - but the taste is pretty close to American Coke. Sprite, on the other hand, tastes awful here in Russia. 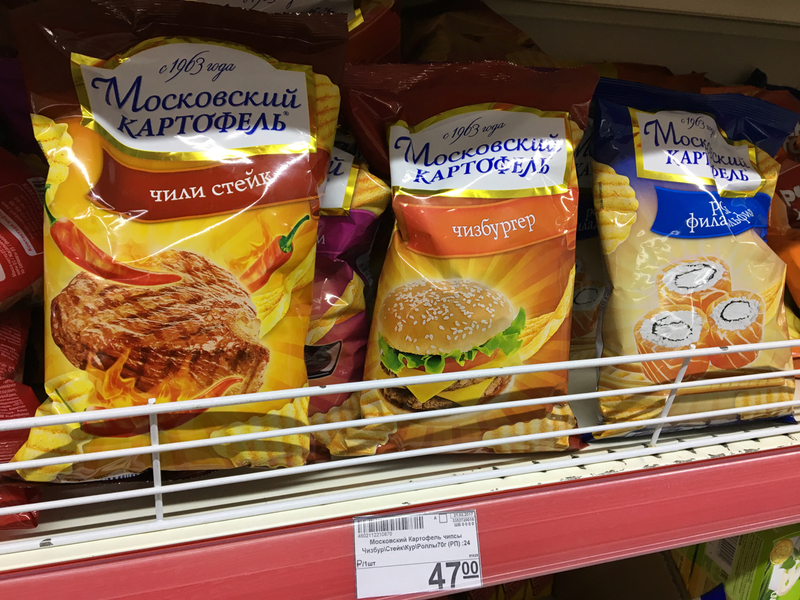 One of the brands I was so thankful to find here in Russia is Lay's potato chips. I am definitely a "salty tastes" person, preferring french fries, potato chips, pickles, etc to sweets. Life without potato chips could hardly be called life at all, in my opinion. And besides potato chips, the salty snack option here is dried calamari or canned fish (insert "yuck" emoji face here). The potato chip flavors here in Russia, however, differ fairly significantly from the flavors in the United States. There is some overlap, like the Original flavor and Sour Cream & Chives (the flavor we buy most often), but that's about it. Some flavors are not quite tailored to our American tastes, like Crab; Bacon; and Cheese. The cheese flavored chips have the color and flavor of cheese-flavored microwave popcorn, so not really my jam. Not Lay's, but interesting flavors nonetheless. One of the things that has kept me busy here in Russia is watching YouTube videos of people testing products. Some of them are pretty entertaining. So I decided I wanted to make a video where we taste some of these interesting potato chip flavors for the first time on camera and give our reactions. Although Ted agreed to participate, I don't think his heart was truly in it because he opened the bag of Lobster-flavored chips and ate them before it was time for our video recording, murdering my vlogging dreams! That may have been my biggest melt-down in Russia so far, which gives you an idea of the hyper-sensitive emotional state I am currently living in. 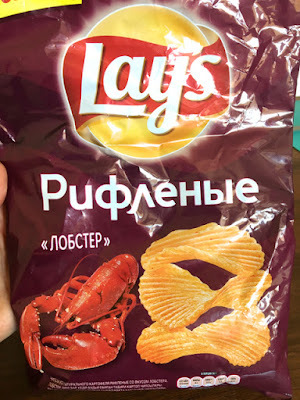 Yes, they truly taste like shellfish. Anyway, we were at the store today and saw that there were two new flavors on the shelf! Argentinian Ribs and Italian Focaccia. Perhaps these flavors have been released in the U.S. as well, but I couldn't find anything online about that so we're going to taste them for you here in our first ever vlog post (video + blog = vlog)! You two are a crack-up! !